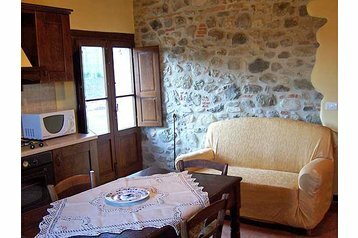 The two apartments we rent are in a recently restored traditional farmhouse in Tuscany, with comfortable, fully furnished accommodation, including modern bathrooms and kitchen. The house is placed in a panoramic position and surrounded by the countryside. 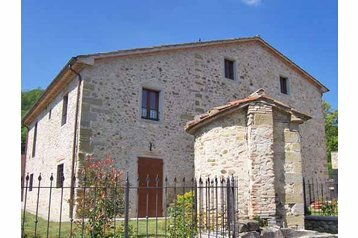 Ca del Bocca Hill is situated a few miles from Anghiari, a little medieval town in the province of Arezzo. In front of the house there is a garden where you can eat and relax at the open air. We also offer the use of a barbeque. For 2-3 persons, it includes a double bedroom, a bathroom, a kitchen with electric oven, microwave oven, TV, DVD player, sofa. For 4-8 persons, it includes two double bedroom, a triple bedroom, a bathroom, a kitchen with electric oven, microwave oven, TV, DVD player, sofa. Anghiari is located in Eastern Tuscany, near the Apennine mountains. Its position, a few miles from the provinces Umbria, Marches and Emilia, makes Anghiari a perfect place for visiting the whole of Central Italy. Florence and Siena can be reached in one and half hours by car. Pisa in a couple of hours. Heading south you can easily get to the main towns of Northern Umbria, such as Perugia, Gubbio, Assisi. Moving to the north, you can soon arrive at the spa centre of Bagno di Romagna. In the same direction, the Republic of San Marino and the Adriatic Riviera can be reached in less than two hours. Szállás családi házban a helység szélén Anghiari, részben Micciano. Kerti grill, kert. Rendelkezésre álló illeték fejében: mosógép, vasaló. Lehetőség lovaglás bebiztosítására. A szállásszolgáltató beszél is angolul. Parkolás a fizetővendégláto-hely mellett. Anghiari - központ 3.5km.